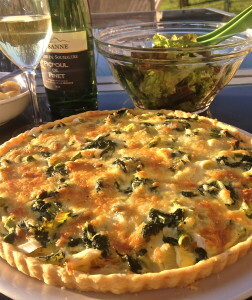 A cheese and chard tart made with Laguiole, a delicious local cheese. Let Marion prepare you a delicious four course meal, served on the terrace and featuring recipes and ingredients from the local area. I’m happy to cater for special dietary needs – just let me know! Wherever possible I use freshly-picked fruit, vegetables and herbs from the garden, and whatever is at its best in the local market.